Much of Whittlecreek and Eaton St Torpid Heritage Railway's web site gently takes the mickey out of assorted real-world organisations and individuals. So the first thought was to call the engineering facility something like 'Broom Engineering' or 'Bombastic Transportation Production Site'. But the thoughts passed. But, just as Brush Engineering had a large sculpture of a falcon which led to the main production site being called the Falcon Works (the sculpture is now at the National Tramway Museum) perhaps Whittlecreek and Eaton St Torpid Heritage Railway's Engineering workshop should also have an ornithologically-inspired emblem. Indeed, given the frequency of fortuitous birds in the Whittlecreek and Eaton St Torpid Heritage Railway web site this seemed essential. 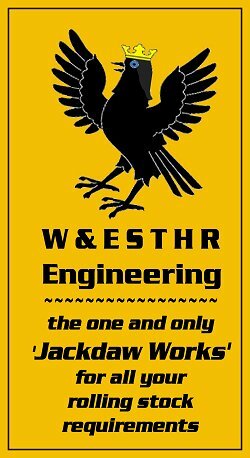 All Whittlecreek and Eaton St Torpid Heritage Railway's rolling stock has been adapted or built from scratch in the 'Jackdoor Works', although only some of the rolling stock bears the W&ESTHR Engineering logo. The illustration at the top of this page which purports to show the elevation of the Jackdaw Works is based on a former Victorian warehouse, constructed in 1870 (although over 200 miles away from north-west Norfolk… ). 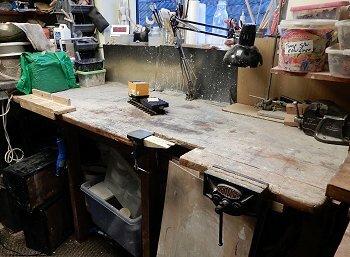 The bench used for Whittlecreek and Eaton St Torpid Heritage Railway's workshop was made by the management's father around 1966. It incorporates part of a pine worktop which had been used at Morley's knitwear factory at Heanor, Derbyshire (where he was Works Engineer for a year or so) – the site of Morley's factory is now a Tesco supermarket. This work surface may date back to the 1930s, certainly the 1950s. About 2010, after the management's father exiled himself to the south coast of Kent, the bench was 'passed on'. So for over fifty years this bench has been in use almost continually for a wide range of DIY and other activities. And has 'real history' prior to that.